@CM_Stewart I now follow the point about drape as being some slack in the system. I always felt the most critical part of the slack in the system was at the tippet end. Not only must the tippet be long enough to have enough slack to drift naturally but it also must have enough slack for the fish to hold on to the fly long enough to even get us to the point of seeing the “drape slack” taken up. So yes while the drape is a type of slack, we are still holding LL off the water and in the air…so it has a tension to it…granted not the same as the rod tip but a tension that a fish must pull on for it to go straight. So the question is does the added slack via drape in a heavier line with that line having added weight and therefore more tension needed to pull it straight actually lead to a fish holding a fly longer? Sounds like you are convinced. I am not. But the topic is for sure interesting and has me thinking over some of these concepts more. As for strike detection, I watch either my knot at the end of the LL or a small section of sighter there for movement. Obviously that is removing the drape, I just don’t think of it as watching for the drape disappearing or line straightening I think of reacting before that while in reality I am sure I am slower than that. I have sometimes found that quicker tension is why you get the hook set as the fish partially hooks himself. I also wonder if the drape difference between 2.5 and 3.5 LL does buy the average angler (given an average human reaction time) a markedly greater amount of time to react - or would that weight difference need to be bigger? I still think I would choose my line based on other factors first…but perhaps in specific circumstances it is more of a consideration? I manipulate the fly all the time when I fish upstream of myself…maybe that is a beginner move…I don’t know…but it is fun. I like to cast into plunges and moments after the fly gets taken down pulse the fly. I sometimes while drifting into what I feel is a prime lie “lift” the fly like it is emerging. I also often cast upstream near a bank or under cut bank and pulse the fly away from the bank…they all work at times. Analyzing things can be beneficial and fun for a time. Then there comes a time to stop, and look at the other side of the coin. The purpose, rather than the how. I read a story where Rush drummer Neil Peart was asked how he does his drumming riffs. A skill no one else has. He replied he didn’t know how he does them. He just can. Going on to say - he didn’t what to think about it to much - fearing that if he tried to analyze it too much he might loose the ability. Maybe learning how to be a more effective angler also needs some balance; a little thinking about method, balanced with some focus on the purpose, letting the subconscious figure out the how. I do not believe slack is the end all in catching fish…but I employ it a ton. God forbid i even rest the end of my casting line on the surface for the sake of slack…in both wind and calm conditions. I catch plenty of fish with all my tenkara sins. Recently i have been catching fish with tight line techiques when the ones with slack do not work…well…convert fish. Sometimes fish take and refuse without line movement. Seems tight line can be the ticket in those cases as when they take…they self engage. Very true…all these ideas and “purposes” as @dwalker points out are good to know and understand so you can try them all. 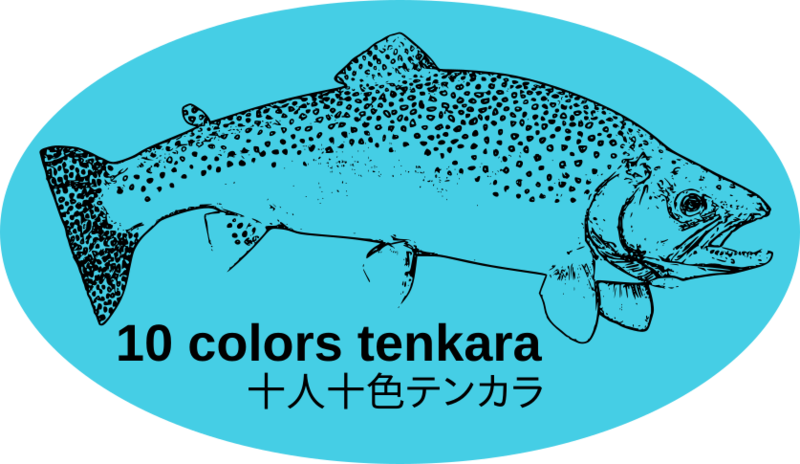 One of the great things about a tenkara rod setup is that much of this you can change without changing gear. So I personally would not choose a line for more otsuri…but choose the line/weight of line I use for the rod, fly, weather and personal preference/casting comfort. I do though now know that maybe if I am not converting the answer could be a bit more or less slack…so that is good to understand. There is a pool under a bridge near my office that I sometimes hit at lunch break. It is all fairly shallow and close quarters. You can see all the action. I have on multiple times while dead drifting seen a fish take my fly…no line movement…and I go to set the hook on seeing the take…sometimes it works sometimes the fish spits it so fast I miss. As an experiment I have also just watched the fish take the fly and waited…they spit it before any line movement. If I were to guess…I convert in this scenario more often when I have less slack and a stiffer rod so that my human speed reaction time is less slowed down by the slack and softness of the rod. Typically the way I do that is try to time the drift so I impart a slight “swing” and “natural” rise in the fly as the system comes taught in front of the fish and hope for a take…more letting the subconscious figure it out. I fished this morning with the 50#. It fished fantastic and I got to land 3 fish. Two browns and one brookie. Not bad for and hour of fishing, but to be fair I know where they are hiding…hahhahaahha. Yes it is true, and I think that I am working to the purpose of arc and a longer line. Today on the water I meditated on some notes of this thread and some notes a friend has been feeding me. The importance of arc combined with line length. My line/leader is 1 -1.25 x of my rod length. Both Peder and my friend notes that they like a 1.5x or greater. I think a lot of guys like that 1.5 ratio. Funny I started with that ratio then started preferring shorter. I may have to revisit that ratio. In regards to arc…my presentation had little arc when I had minimal tension. A longer line would have more and also change the presentation angle slightly. Gotta try it next time. Good thing this line is cheap…I can goof around with it until I find my golden ratio…hahaahhahaha. For some, this will help. The more I use my tenkara rod? The faster I’m getting away from this. I have my own thoughts on it but they are so different yet much in the same method. But, it’s nice reading although in my case, It doesn’t affect my own fishing. I was wondering where you were. Good to see that you have not left us. Not much of a chess match…more like bees flying in my bonnet. I was a little surprised the home-made nylon tapered line weighted slightly less than the 4m of FC LL. Especially because it appears his home-made line is actually be a 4.3m line. Also he has attached a chichiwa loop, チチワ, as used with furled / twisted lines to the FC LL. Anyway, this July 2016 blog post is another example of another person being curious about line comparison. That’s somewhat similar to me @dwalker. My scale only only goes down to 0.1g and I’ve suspected it’s not sensitive enough to get the specific mass of the lines. When I weighed mine, it was the average of three attempts per line. For me, there was only one that I had to average the weights; all the others came out the same. His scale looks like it is manufactured by the same company that mine is made by. I would like to do it over again as I feel like I had too many variables to really get an accurate picture. When I did it, it was more quick and dirty to get a rough idea. Yeah, 0.1 gram isn’t much weight, 1.543 grains or 0.00353 oz. I have a small digital scale that came with a 50 gram calibration weight. Boxes with a selection of calibration weights can be found on Amazon. It might be interesting to see if the same weight for the lines would be measured if a calibration weight near mid-range of the scale were put on the scale and the scale zeroed with that weight. Then weigh the line again. The calibration weight on the scale might force it into a more linear place on it measurement range, avoiding a nonlinear portion of the scale at weights near bottom of its measurement range or near the top of the range. But this kind of thing is only interesting to our geeky nature if we have one.